A pioneering scheme that is leading the way in improving some of Yorkshire’s best countryside has won a prestigious national award. The Upper Aire Project won the Green Apple award for its work on improving the environment and wildlife, particularly fish, in the River Aire and its surrounding catchment area. The project is run by the Environment Agency, Yorkshire Wildlife Trust and the Yorkshire Farming and Wildlife Partnership, with the support of local businesses and landowners. Having competed against more than 500 nominations, members of the partnership were presented with the Green Apple award for Environmental Best Practice at a ceremony at the Houses of Parliament. I’m really proud of this project and I’m over the moon we won this award, especially as the award is for partnership working, which is a major reason it is such a success. 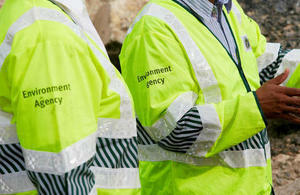 Over the last five years the Environment Agency has spent £368,000 on the project, with a further £90,000 over the next three years just committed. This has been matched by £356,000 from partners, private organisations, landowners and environmental charities. There has also been more than £100,000 worth of manpower contributed, thanks to volunteers working the equivalent of about 2,000 days. The Upper Aire Catchment is beautiful. Picturesque streams feeding into the burbling River Aire as it flows through the Yorkshire Dales and down into more urbanised areas such as Bradford and Leeds, eventually joining the River Ouse at Goole. But that beauty belies a series of issues which meant that wildlife, and fish particularly, were struggling to get a foothold in some areas, which is why we put the project together. To be successful the project needed to capture the hearts and minds of landowners and farmers, but they were quick to lend their support once the project demonstrated the benefits. The Upper Aire Project team made a really compelling case for converting some marginal land at the top end of Otterburn Beck to wet woodland. Soil is my most precious resource, so any extra ways of keeping it on the land instead of seeing it washed into local becks are really welcome. Doing that successfully means everyone wins – I keep my soil and the water quality will improve. The Upper Aire Project installed 13 leaky dams in the gullies which drain water from the land above my farm. At Christmas we had record-breaking rainfall but our farmhouse didn’t flood, despite this being a fairly regular occurrence until then. There’s no question in my mind that the two things are related. It will be a long road before we see fish numbers increasing, but we’re confident our work has not only changed the health of the upper River Aire, but the mindsets of many landowners too. In addition to the environmental benefits the project team used only local contractors and supported the economy by having all meetings at local farm shops. The format of the project is already being scrutinised by new partner, the Yorkshire Dales National Park, with a view to implementation on their land in North Yorkshire. The honour comes after the project won the Large-Scale Habitat Enhancement Scheme award at the Wild Trout Trust Conservation Awards last year. The Environment Agency undertook the huge task of gathering information and making the assessments, and was left with a brilliant picture of not only the health of our rivers and streams, but what was impacting this. Before starting any work, YWT volunteers walked the majority of the catchment, mapping sediment sources and collecting information such as land use, vegetation and presence of non-native species. This allowed us to rank the sources and identify priority landowners. In the headwaters of the River Aire and its tributaries, sediment is the main issue for fish, impacting on their ability to spawn. Working with willing farmers we focused on installing fencing to exclude their stock from the river, targeted riverbank restoration and planting trees to absorb rainwater as it flows down the hilly catchment. Working with YWT and Yorkshire Farming and Wildlife Partnership a demonstration site in Gargrave was established to show the difference buffer strip fencing and selected planting would make. At the demonstration site we: rebuilt the bank along the river, which had been poached for years by 300 dairy cattle; installed fencing to create a buffer strip to allow grass to re-establish; and reinstated fencing and installed a new gate which meant the cows took a route away from the river to be milked. This site has since been used at engagement days to show local landowners what’s possible and to help recruit more to the project.